Get Ready for Pentascale Duets! 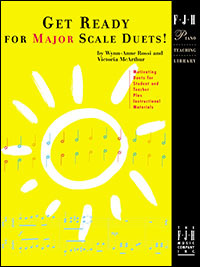 Motivate student practice with these musically appealing scale duets written for student and teacher. 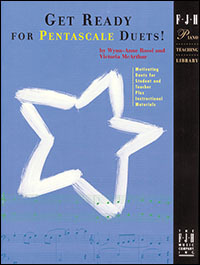 In this book, each duet part is an adaptation of a well-known theme by one of the great composers. Innovative instructional material includes games and pentascale practice flashcards. A new addition to the highly popular FJH Piano Teaching Library series is this ingenious publication which tackles the problem of student motivation by pairing each major and minor cadence and arpeggio with a tuneful teacher duet. Motivating features in this book include: Fun theory games, practice flashcards, a chord and arpeggio expert certificate, and more. Students will enjoy practicing cadences and arpeggios! Get Ready for Major Scale Duets! A creative, motivational book designed to make scale practice fun and enjoyable. Each scale is paired with a tuneful teacher duet, encouraging student interest while promoting technical development. Includes instructional pages, review games, ear-training activities, scale reference charts, technical warm-ups, and more. 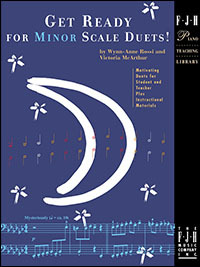 Get Ready for Minor Scale Duets! 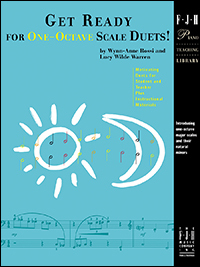 This second volume of scale duets shifts the focus to minor scales, tackling the problem of student motivation through teacher duets, activity pages, review games, and more. This innovative approach helps make scales an enjoyable part of daily practice! The importance of the technical and intellectual proficiency of scales is a key element for a student's overall musical success. Scale practice is often avoided because it is considered tedious and boring. Get Ready for One-Octave Scale Duets! tackles this problem by pairing each major and minor scale with a tuneful teacher duet that motivates students to prepare their scale assignments. Also included in this book are music games for review, practice flashcards to keep scale practice fresh, and a One-Octave Scale Expert certificate. Get Ready for Chord and Arpeggio Duets! Book 2 introduces the student to major and minor chord inversions and two-octave arpeggios. 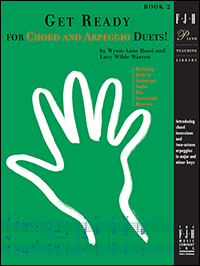 As in Book 1, this volume includes a teacher duet for each inversion and arpeggio, as well as instructional pages, a mastery checklist, and theory games. This book helps make the learning process fun and an enjoyable part of daily practice!